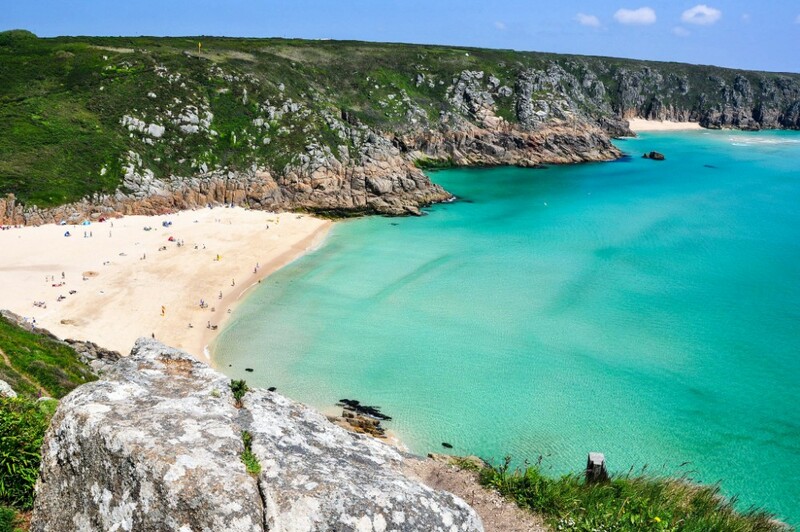 Dubbed as one of the best-hidden beaches in the UK, Porthcurno Beach is tucked away in a cove thanks to Logan Rock. Porthcurno, also known as “Port of Cornwall”, is a small valley that became famous for its involvement in early submarine communications. The place was used as an office for the Eastern Telegraph Company, who handled the operation of cables for ships and submarines. Although the office closed in 1970, Porthcurno remained famous for telegraph communications and building the Porthcurno Telegraph Museum. Porthcurno Beach can be found sheltered by the Logan Rock which is an 80-ton granite rock. It is a 30-minute walk from the Porthcurno Telegraph Museum so if you happen to visit the museum, you might also want to take a walk along the beach. To be specific, the beach is on the south coast of Cornwall with Land’s End as one of its landmarks. Since it’s on the south coast, the view you get facing the waters is toward the southeast. Apart from the granite rock that surrounds the beach and turns it into a cove, Porthcurno Beach is famous for the privacy it gives to its visitors. It’s a great place for families and friends to relax and soak in the warmth of the sun. The beach is also filled with white seashells that add character to the shore. The waters are a must-try too. Especially when it’s low-tide, visitors can swim farther from the shore without having to worry about drowning. And even if you don’t plan on swimming, the turquoise waters are a great sight to see. Just a few meters from the beach are restrooms you can use. The Porthcurno Beach has received multiple awards so it is being maintained to be clean. In fact, when you visit the beach, you will not see any establishments or stores there. The nearest coffee shop is a few minutes away from the actual beach. You can also find a carpark nearby. There are many things to do in Porthcurno Beach simply because the water is clear and shallow especially when it’s low tide. You can swim, take walks on the shore, or explore the cliffs beside the beach. However, you cannot expect to learn how to surf or kayak here as there aren’t any stalls offering lessons and equipment. The Porthcurno Beach is a very family-friendly beach, so you can surely do a lot of fun family activities here. You can also bring food and have a picnic while your children search for seashells on the shore. There are two nearby beaches from the Porthcurno Beach. The first one is called Green Bay, which is to the right of Porthcurno Beach. However, you cannot go there directly from this point unless it is low-tide because the area cannot be accessed during high tide. Another beach nearby is the Pedn Vounder which is also a cove thanks to the Logan Rock. You can visit this beach by taking the steep footpath from the Logan Rock.